Just read this article at Macstories because it's better than I could probably write. The only thing I have to add, is to check out Nebulous Notes. Whatever a writer's taste, we have great options to work with. It's a good time to be a plain text kind of person. 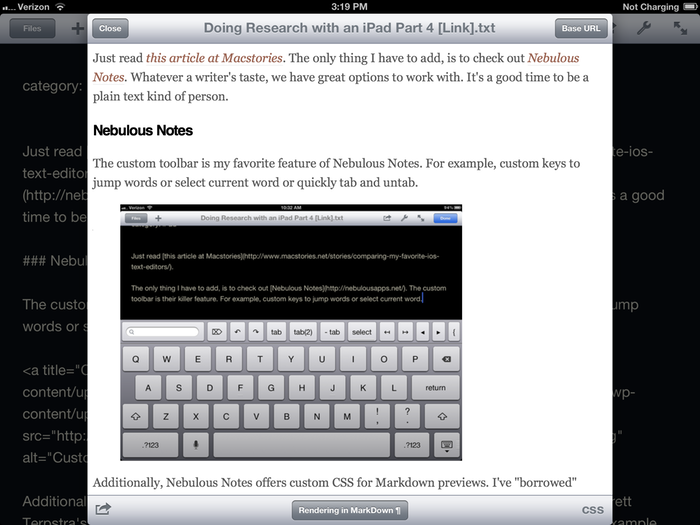 The custom toolbar is my favorite feature of Nebulous Notes. For example, custom keys to jump words or select current word or quickly tab and untab. Some of these can be accomplished with TextExpander (which Nebulous supports) but several can not. I also like the the option to tap the window header to jump to the last document. It makes working with multiple documents very convenient.